One of my favorite things about academia is the day-to-day flexibility afforded. That said, it comes with certain challenges. One of the biggest challenges is how unstructured most days are and how many distractions are present. These distractions can be enjoyable (FB, Twitter, Netflix) and unenjoyable (Gmail, less-urgent tasks, etc.). Combined with my natural procrastination tendencies, this has the potential to be a serious problem. It left me less productive than I wanted to be while also causing me to feel 1) overwhelmed, 2) unsure of progress, 3) stressed. This is a deadly combination of my work time being sub-optimally productive and my fun time being sub-optimally fun, since I’m stressing about my progress. 2. Better, more focused work. 3. More confidence. I now have record of my productivity, removing much of the self-doubt. 4. More enjoyable, relaxing, and recharging fun times. 5. Because of 1-4: More productive output with work, school, chores, and self-improvement (gym + other good habits). The main thing I did was to start using the Freemium App “Todoist.” It’s nothing more than a To Do List application, but with a clean interface, some nifty features, and available everywhere (PC, Mac, iOS, Android, etc.). This helps your daily engagement with the app. With Todoist, I forced myself for the first week to put in and schedule every task that took more than a few minutes to complete. This includes recurring tasks (Todoist has a great feature to handle recurring tasks!) like regular chores around the house, regular blocked time for clearing out my Gmail Inbox, creating my weekly questions for discussion section, etc. By having these recurring tasks, they show up on my daily to-do list with zero marginal effort. This means I removed much of the mental fatigue and stress that comes from trying to remember what I need and want to do. It also makes it much easier to actually develop the habit of keeping a daily to-do list. Todoist also has great collaborative features. So Rachel and I have a shared “project” for tasks that are for each of us. Bobby and I have a shared “project” for getting in shape (“BEEFCAKE Project”), which allows us to keep tabs and motivate each other. After a week of being happy with this, I decided to broaden what I would use Todoist for, and started including recurring “life goals.” These included daily goals that I wanted to achieve but rarely did. Things like flossing, brushing twice a day, taking nutritional supplements, 30+ minutes of light+ exercise, 30+ minutes of fresh air, etc. They also include longer-term goals, like regular updates with my dissertation committee, paying down debt, etc. After another happy week, I stumbled across a popular time-management method: the Pomodoro Method. 2. Estimate how long each task would take to complete. 3. If a task takes more than 30 minutes, break it up into sub-tasks. 4. Create a certain amount of daily units of time where you will focus all your time and energy on completing that task. These units of time are “Pomodori,” which sounds dumb, but don’t worry too much about that. (The most common is 8-10 pomodori a day). 5. Break up those Pomodori with a 5 minute break, and a 30 minute break after you complete 4 of them. 6. 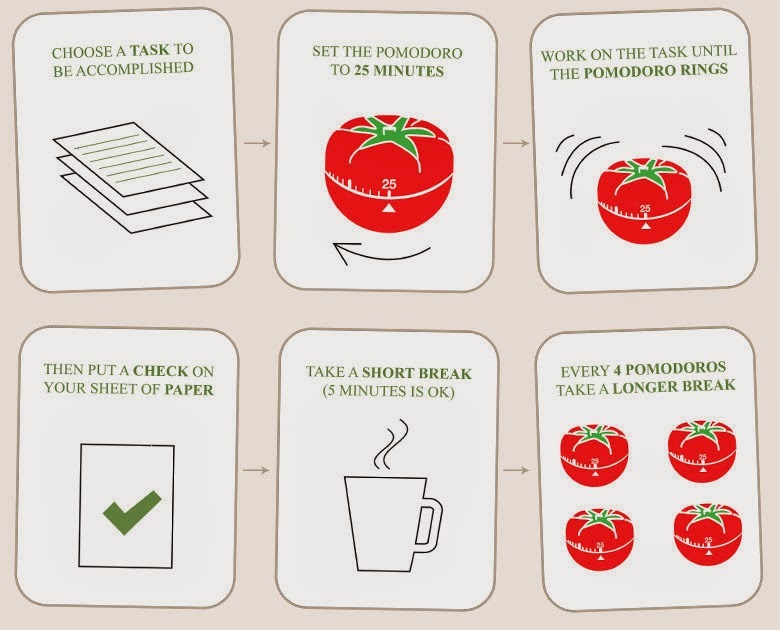 Assign your tasks to each Pomodori. 7. When you start working on a Pomodori, set a timer for 25 minutes. 8. When you complete your Pomodori, mark it as completed and take a 5 min break. 1. Creating a “Pomodoro” Project in Todoist. 2. Within that project, I created 10 week-daily recurring Pomodori’s (1st Pomodori, 2nd, 3rd, etc.). 3. These now automatically populate my daily to-do list. 4. I then arrange all my daily tasks underneath each Pomodori. 5. I then go through the day, with my timer, marking them off 1 at a time. When I’m done with the list, I can do whatever I want for the rest of the day and not feel guilty by what I “should” be doing. I now have an adaptable and flexible structure placed on my life. This won’t be for everyone and every lifestyle. Some have the inherent work ethic and focus to not need any prodding. Some may have a boss who unfortunately does the prodding for them. But for me, so far, this has been a great boon to my life.